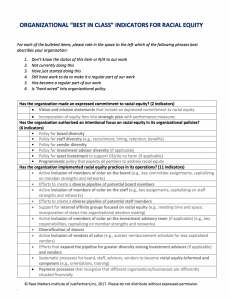 Racial Equity – JustPartners, Inc.
Would you like to envision what a fully racial equity-focused organization looks like? Would you benefit from a tool that helps you assess your own organization? Are you ready to create an overall strategy for being Best in Class as a racial equity-driven organization? See if this tool can help you accomplish any or all of those aspirations. Get an overview of the elements of RMI introductory trainings through these key resource materials. Prepared for the Annie E. Casey Foundation, along with the Series below. 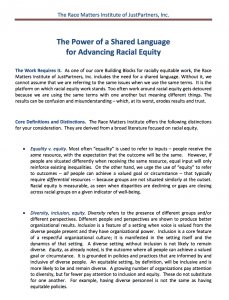 Offers concrete guidance to create policies, programs, and products that advance racial equity for children and families of color. #1 Guidelines for Achieving Staff and Board Diversity. Would you like your organization to have access to a wider range of ideas and perspectives on your staff and Board? Use this guidance to make that happen. 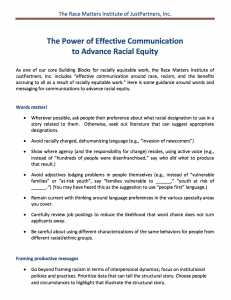 #2 Guidelines for Promoting Racially Equitable Purchasing. 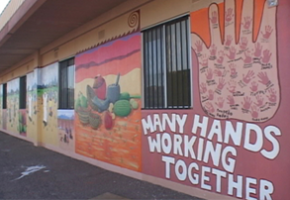 Does your organization support the broad community when it selects its vendors? Use this guidance to identify how to make that happen. 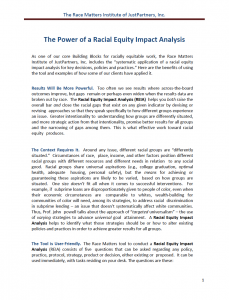 #3 Advancing Better Outcomes for All Children: Reporting Data Using a Racial Equity Lens. 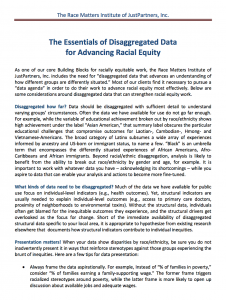 Be sure that the dis-aggregated data you use functions to advance your work toward racial equity. We offer important guidance and cautions for your consideration. #4 3 Tools for Getting Started with the Race Matters Toolkit. 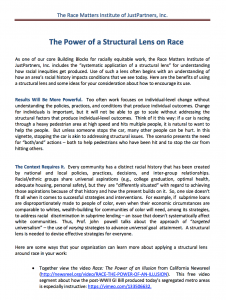 This brief summarizes the three core tools from the Race Matters Toolkit – what they do and how to use them. Responsible Government: Investing in the Well-being of Black Fathers, Families and Communities. Prepared for the Annie E. Casey Foundation, October, 2009. An examination of how the mutual and interlocking responsibility of effective government policy and African American fathers’ engagement can improve the lives of African American children, families, and communities. Executive Summary: Responsible Government: Investing in the Well-being of Black Fathers, Families and Communities.